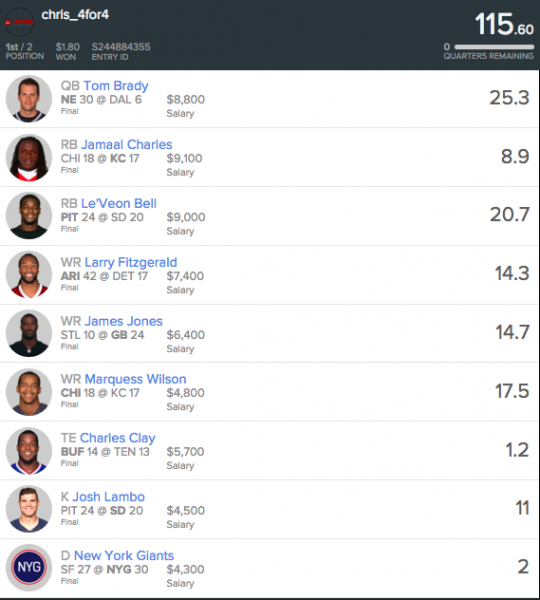 Welcome to 4for4's FanDuel Bankroll Builder series. Many thanks to FanDuel and Josh Moore, who have staked me a $1,000 bankroll on FanDuel which I began playing with in Week 4. Throughout the season, I'll document all my gains, losses, and shower cries along the way. More importantly, I'll walk you through my thought process as far as bankroll management, game selection, player exposure, and my main cash game lineup(s) in hopes that we'll both learn valuable lessons from my successes and failures. Editor's Note: The 4for4 Championship is still going strong in Week 5 - and now we're rolling out something special! This week's tournament still awards 5 Championship seats and $7,000 in cash prizes, but in Week 5 you can enter for only $5 (instead of $10) and you can also win a FREE VIP TRIP to Las Vegas for the World Fantasy Football Championship Event in December! The trip will include a hotel room and round trip flight, as well as access to FanDuel's exclusive parties the weekend of the event. This will be the weekend of a lifetime, and your best chance to get there is in the 4for4 Championship. Draft a team now! Week 5 was rough, as Jamaal Charles got hurt and Charles Clay laid a complete egg. I pivoted to Marquess Wilson Sunday morning once Alshon Jeffery and Eddie Royal were confirmed out, but the play was wasted by the aforementioned duds. Clay popped up on the injury report in the middle of the week with a calf issue, which I should have taken more seriously, as I generally don't use players with any kind of injury issue in cash games if I can help it. In fact, I pivoted off Julio Jones on Sunday morning as well after it was reported that he was legitimately questionable. I played the usual 20 percent of bankroll: $228, split up as 80 percent in cash games ($147 in heads up, $36 in double-up), and 20 percent ($45) in GPPs. I failed to cash in any double-ups or GPPs, and as a result made only $97 of my $228 back. Let the shower crying commece. I started out by inserting chalk plays Edelman, Fitzgerald, and Gates. I initially wanted to get Tom Brady or at least Carson Palmer in at QB, but I also wanted a Foster-Forte combo at RB, so I ended up dropping down to Rivers. Facing a Chiefs defense ranked dead last in WR aFPA coming in to the game, Mike Wallace was a calculated risk that didn't pan out, but he did allow me to build a reasonably strong roster around him. 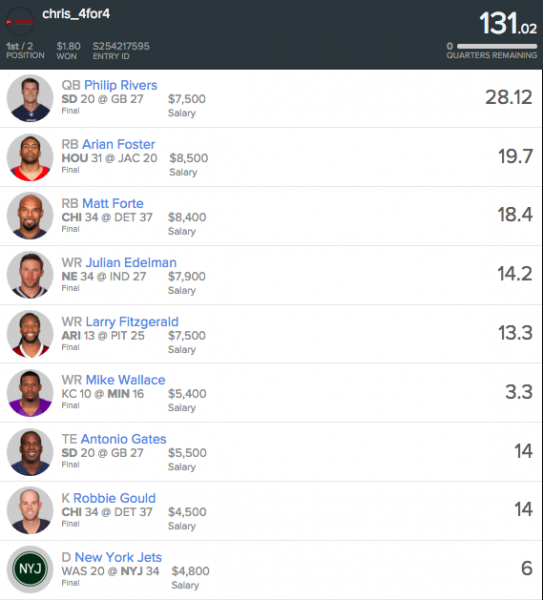 I put the usual 20 percent of money in play, with 80 percent going into cash games and 20 percent into GPPs. Despite a pretty good score, I only made $208 on $197 of entry fees, and there's a valuable lesson to take away fromt that, which I get into below. Because I didn't want a repeat of Week 4 where I was in a time crunch near lineup lock, I posted all my head-to-heads at once last week to save time. The reason to play head-to-heads to so that you can get exposure to a diverse group of competition. However, if you post all your head-to-heads at one time, there's a chance the same player may scoop up a large portion of them, thereby defeating the purpose of playing a lot of head-to-heads. This is what happened in Week 6, as I ended up playing one player in 41 head-to-heads. My 131 was a good score, but no match for his 138. The 41 heads up losses against that single opponent put a dent into my Week 6 profits. This is a valuable lesson. If you plan to play a high volume of head-to-heads, post them a few at a time, say 20 on Friday morning, 20 on Friday evening, 25 on Satursday, etc. Another option if you have the time is to actually pick up other people's games, which can be very advantageous because you can get an idea of how good your competition is. That method can be time consuming, though. One last way to remove the risk of one person scooping up all your head-to-heads is to play more double-ups and 50/50s instead. However, this lends itself to multiple lineups; if you have one lineup and it tanks, you'll lose all your games, whereas you may face some head-to-head opponents with weaker scores. If the player poool in a given week lends itself to playing more than one cash game lineup, it's fine to increase your exposure to 50/50s and double-ups at the expense of head to heads, but don't force it.